Baldwin graduate J.J. Eno was motivated to make the baseball team after he was cut as a freshman. There might not be anyone from Hawaii who exemplifies the true meaning of a student-athlete better than Brown senior J.J. Eno. Eno was a three-sport star at Baldwin in football, baseball and soccer, but might have been known more for his work in the classroom. He graduated as the class valedictorian in 2004 and accepted an offer to go to Brown as part of a program in Liberal Medical Education that would ultimately send him to the Warren Alpert Medical School, which accepts fewer than 100 applicants a year. Eno was fully prepared for the challenges that awaited him academically, but he wasn't willing to give up the possibility of playing sports in college. "I went in thinking I was going completely for academics," Eno said. "If I just so happen to make the baseball team, it would be an added bonus." Eno, who is 5 feet, 8 inches tall, figured baseball would be his best opportunity to play sports in college because of his physical stature. Before he even had a chance to walk on, he first made sure he was comfortable fitting in academically at an Ivy League school. Brown lets its students pick its own courses from the start, which made things a lot easier. "That made things a lot more flexible," Eno said. "It helped me work my schedule around baseball." Eno was still getting accustomed to the East Coast when he went out for the baseball team as a freshman. Much to his surprise, tryouts consisted of a couple of ground balls, about 10 swings and a quick run. The Bears coaching staff got roughly a 10-minute glance at Eno before deciding to cut him from the team. "It was kind of a sad feeling not being able to play sports for an entire year," Eno said. "It motivated me to get bigger." Eno's academic standing required him to graduate in four years in order to stay in the medical program. Most kids would have been intent to give up a first try and focus on classes, but Eno didn't let his dream of playing baseball die. He was told he was cut "because it was a numbers thing," but Eno watched the baseball team his freshman year and knew he had the talent to make the team. He dedicated himself to hitting the weight room and getting faster and stronger. A year later, he was back out on the field trying out again. "I was motivated and I knew what to expect the second time," Eno said. He made the team and went on to play sparingly in 17 games that year. The added responsibility of playing baseball didn't affect his work in the classroom. He had finally found a nice balance between sports and academics. It also helps that he doesn't find the curriculum to be as stressful as he thought it would be. "It gets a little crazy around midterms, and finals gets pretty tough, but it's not as bad as you think," Eno said. "You find time to get it done," he added. Eno's baseball career really took off his junior year. 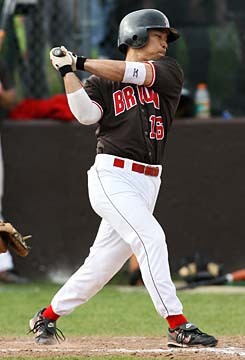 The Browns won the Ivy League championship for the first time in school history and Eno played a critical role. He spent most of his time hitting second in the order as the designated hitter and batted .309 in 21 starts. The Bears advanced to the NCAA Regional in Texas, where they played Wake Forest and the host Longhorns. Brown didn't win either game, but it didn't take away from a successful season. "It was a really good experience," Eno said. "You're probably going to see a few guys eventually make it in the pros from the other teams." This season, Eno is filling in at first base for the regular starter, who had surgery on his wrist over a month ago. Eno is fifth on the team with a .273 average and tied for second in both doubles and RBIs, which is pretty good for a kid who three years ago was told he wasn't good enough to make the team. "I always felt like I could play at this level. It was just a matter of me being able to show it," Eno said. "In a sense (my success) has surprised me. "I came in with very low expectations as far as athletics." Eno will graduate in the spring and enroll in the graduate program in the fall. Every summer, he returns home to Maui for a much-needed break. "I always need those two to three months of sun," Eno said. "I'll never get used to the cold weather up here."